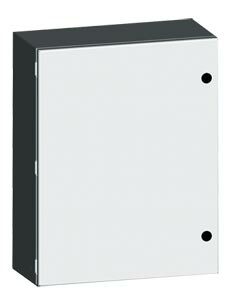 IP66 rated electrical enclosures and cabinets can be used indoors or outdoors. These enclosures are designed with hinge pins for easy door removal and have standoffs for mounting sub-panels. They are designed to house electrical controls, instruments and components in areas, which may be regularly hosed down or are in very wet or oily conditions. The SCE-ELJ series electrical enclosure and cabinets provides protection against windblown rain and dust, splashing or hose directed water, and external formation of ice. ANSI-61 grey powder coating inside and out over phosphatized surface. Optional panels are powder coated white. Swing Out Panel Kits for Enviroline Series - allows installation of sub-panels in front of enclosure with swing out access.